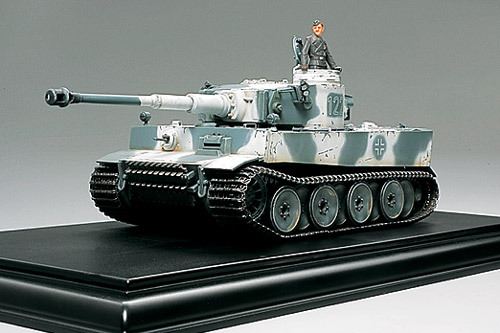 【 The First of the Pack 】　The first German army unit to receive the Tiger I was s.Pz.Abt.502. The unit's 1st Company took the very early Tiger I into battle on the Leningrad front during the winter of 1942. These tanks did not have any fenders, exhaust covers, air filters or towing cables, and even had to take their tool boxes from the Panzer III. 【 About the Model 】　★Length: 240mm ★Fully-finished display model depicts a Tiger I Initial Production belonging to s.Pz.Abt.502. ★Accurately depicts the spartan tank without fenders, exhaust covers, air filter, or tow cables. ★Spring-loaded main gun enables realistic recoil action. ★Die-cast chasssis for added weight and realism. ★Caterpillar tracks feature realistic sag effect. ★Distinctive winter camouflage pattery expertly applied complete with weathering effects. ★Comes with 1 commander figure and high-quality display base.